As you may have noticed by now, we love Halloween around our house. We decorate, go to hayrides and pumpkin patches, make crafts, and make all kinds of Halloween themed food and drinks. For lunch, I made peanut butter and jelly sandwiches and cut them into shapes with a pumpkin shaped cookie cutter. I cut up pieces of candy corn to create the eyes, nose, and mouth. (Mini chocolate chips or M&M's would also work well.) I also cut apples into thin slices. 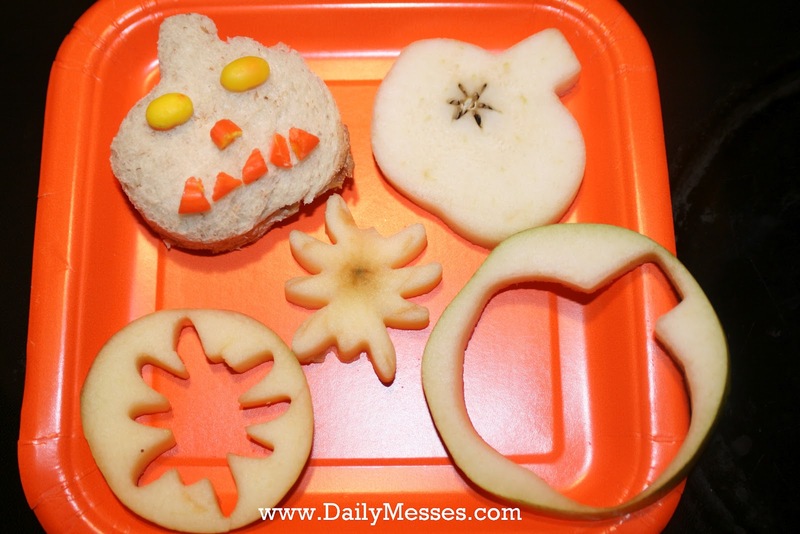 I cut them into pumpkins and spiders with cookie cutters. (Slices from the wide part of the pear and thin slices of watermelon, cantaloupe, or cucumbers work well too.) There are so many cookie cutters to choose from: witch hats, spiders, pumpkins, cats, ghosts, coffins, skulls. To add more of the Halloween spirit, make ghost cups! 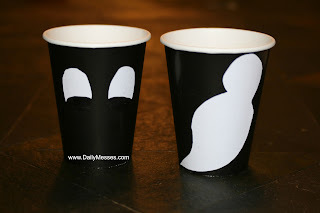 Simply cut out ghost shapes or eyes out of white sticker sheets or labels. Stick to black cups and you have ghost cups! Make a wrap sandwich using a green (spinach) tortilla. Cut in half. Using edible markers, draw on a Frankenstein face. Make a sandwich on a hot dog bun. Draw on a monster face with edible markers. Cut cheese triangles to hang out of the open end to look like teeth. Make pretzel bones. Push mini marshmallow on the ends of a pretzel stick. Dip in melted white chocolate or white candy melts. Gently tap fork or spoon against chocolate container to let excess drip off. Place on a piece of wax paper to let set. Draw ghostly or scary faces on large marshmallows with an edible marker. Draw a ghostly face on a banana peel. Your Halloween themed food is awesome! I think I need to add a bit more fun to our food around here. Thanks for the inspiration - cups are cute too! Thank you! You just made my day :) I'm glad you like the posts.